When Noah left the ark there were only 8 human beings alive in the whole wide world. They were all members of the same family and probably looked pretty much alike. They spoke the same language (Genesis 11v1). Now we have many different peoples scattered over all the earth, with different skin colours and features, speaking many different languages. How did all the languages come about? Where did the ‘races’ come from? How did all the different skin colours arise? Are all black people cursed? What about cavemen? Once again, the Bible is the key to the past. Genesis chapter 10 tells us how the descendants of Shem, Ham, and Japheth began to spread out to fill the world with people. Then Genesis chapter 11 gives us the reason why they began to spread out – confusion of their language at Babel. Did the tower of Babel really reach to heaven? Is it not just another ‘story’? The Bible makes it clear that all people on earth at this time spoke the same language. Also, the people had left Ararat (where Noah’s ark had landed) and moved eastward for the fertile plains of Shinar (Genesis 11v1-2), situated in the region of Babylon. All the people alive in the world at this time were settling together (Genesis 10v4 – “lest we be scattered abroad upon the face of the whole earth”). They were not scattering to fill the earth as God had distinctly commanded them to do (Genesis 9v1). Thus, they were disobeying God and disobeying God is sin. God had judged the world in Noah’s day because of the wickedness of the people but the worldwide flood had not eliminated sin from this world. People were born with a sinful nature that caused them to rebel against the Thrice-Holy God. Animals would have started to spread out immediately after the flood and so would have reached other countries before people did. As the people settled together in one place in disobedience to God, they decided to build a city and a tower, lest they would be scattered (Genesis 11v3-4). Perhaps the post-Flood world was so inhospitable that they wanted to stay close together. Please notice that there were those who were skilled in building. Notice the use of the word ‘us’ in Genesis 11v3-4 – “let us make brick…. let us build us a city and a tower…. let us make us a name.” The people were choosing to go their own way, doing as they wanted and making a name for themselves, without taking God’s will into their considerations. Man defies God because he thinks that he knows better than his Creator. The tower that they proceeded to build probably looked like ziggurat, a stepped structure. The words “whose top may reach unto the heavens” (Genesis 11v4) may be taken to mean that the tower was going to reach into the heavens, a figure of speech meaning it would be impressively high (like we talk of ‘skyscrapers’). However, it may also mean that its top would be, like some of the ziggurats in ancient Babylon (Babel), open to the heavens as a giant astrological observatory for the false worship of those times. This temple tower would have been used for false worship – worshipping the sun, moon, and stars. Thus, the people sinned against the Lord. They rebelled against the True God. As the Omniscient (All-knowing) LORD viewed man’s plans and work at Babel, He knew they would stop at nothing in their rebellion against Him and in their pursuit of sinful practices – “and now nothing will be restrained from them, which they have imagined to do” (Genesis 11v6). Notice the “us” in Genesis11v7 is not referring to God speaking with the angels; it refers to the Three Persons of the Trinity (God the Father, God the Son, and God the Holy Spirit) speaking amongst each other. Man’s disobedience is rebellion against the Thrice-Holy God. God scattered the people because of their sin. He did this by giving them different languages (Genesis11v5-9). Each family group could not understand the other family groups. Thus, the work had to cease and they were forced scatter over the earth as God wanted. To help you understand what it was like at Babel that day, picture yourself working on the building site, joking with your workmates and taking instructions from your supervisors. Then, all of a sudden everyone around you starts speaking in different languages and the only people you understand in the whole wide world are your family. Genesis 10v32 seems to indicate that the dispersion of people across the earth was generally along extended family lines. This was the result of the sudden creation of new languages described in Genesis11v1-9. In such a breakdown of communication tempers would flare, suspicions abound, and hostilities would rapidly drive groups that spoke different languages away from each other. However, all the people within each family group or ‘clan’ would have spoken the same language. Thus, the family groups had to spread out. The earth was divided in the days of Peleg (Genesis 10v25). This refers to the scattering of the people from Babel. Peleg was born about 100 years after the Flood (cp. Genesis 11v10-19). As each family group moved apart from the others, some groups would have been more skilled than others. The seeds of rebellion against God – false worship and sinful practices, including astrology – were taken with the people as they scattered from Babel. Genesis 10v32 is a key verse that sums up how the descendants of Noah were divided after the Flood at the time of their dispersion from Babel (cp. Genesis 9v18-19). They were divided along extended family lines. Genesis chapter 10 makes it very clear that people were divided “after their families, after their tongues (languages), in their lands, and in their nations” (Genesis 10v5, 20, 31). God gave each family group or ‘clan’ a different language, causing them to spread out to fill the earth with people. The descendants of Japheth are listed in Genesis 10v1-5; the descendants of Ham are listed in Genesis10v6-20; and the descendants of Shem are listed in Genesis 10v21-31. 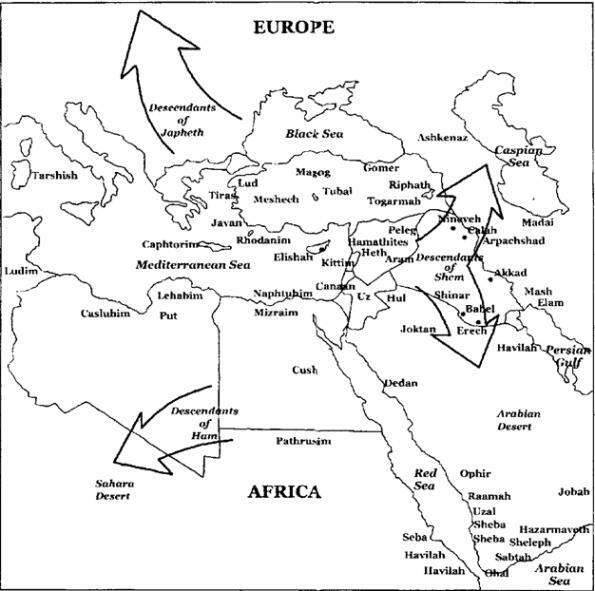 The map above gives a basic idea of the direction in which the families descended from Shem, Ham, and Japheth went. The genealogy of Shem is given in more detail (Genesis 11v10-32) because it is from this line that Christ the Messiah is descended. Please note that Eber (Genesis 11v14-17) was the father of the Hebrews through Abraham. Shem is described as “the father of all the children of Eber” (Genesis 10v21), although Eber (Heber) was Shem’s great grandson. Not all the descendants of Ham went down into Africa. The descendants of Canaan went to inhabit the land of Canaan (Genesis 10v15-19) and God would later give the land of the Canaanites to Israel (cp. Deuteronomy 7v1; Joshua 3v10; 24v11). Were all Present-day Languages Spoken at Babel? Language has not evolved from animal grunts. God created Adam and Eve with the ability to understand and communicate in one language. All people spoke this one language up until the time of Babel when God miraculously and suddenly programmed each family group with a different language. Different languages originated at Babel. God did not give all the many languages spoken in the world today at Babel for there were not thousands of separate family groups or ‘clans’ then (cp. Genesis chapter 10). Each of the different languages created suddenly by God at Babel could each subsequently give rise to many more. Language gradually changes, so when a group of people breaks into several groups that no longer interact, after a few centuries they may each speak a different (but related) language. Today we have thousands of languages, but less than 20 language families. Where did all the ‘Races’ come from? There is only one human race. God “hath made of one blood all nations of men for to dwell on all the face of the earth” (Acts 17v26). We have all descended from Adam and Eve. God created Adam and Eve with the ability to produce children with a variety of characteristics. This ability was passed on through Noah and his family. After the Flood, there was only one language and one culture group until the time of Babel. Thus, there were no barriers to marriage. This would tend to keep the skin colour of the population away from the extremes. Once separate languages were imposed at Babel, there were instantaneous barriers to marriage. People had to marry within their own family group or clan. Dispersion from Babel was in family groups (Gen 10v5, 20,31-32). They were forced to move apart and live in different environments. They became isolated from the other groups. Each group had genes for a certain combination of characteristics – e.g. skin and hair colour, eye and nose shape, etc. As people had to interbreed within their own language group, the variations in the outward appearance of people were no longer averaged out. The dispersion at Babel broke a large interbreeding group into small, inbreeding groups. This ensured that the resultant groups have different mixes of genes for various physical features. As people spread out from Babel, they took with them different amounts of information for certain characteristics, and so many different people groups/cultures developed. It is interesting to note that scripture does not divide the peoples of this world by their skin colour, but rather by their tribes and nations. There is no doubt that as people dispersed from Babel to fill the earth as God desired (Genesis 9v1), some groups were better suited than others to certain conditions. God guided the dispersion of people across the earth, despite personal choices and ability to adapt to their new environments. Today, we have many different people groups (often called ‘races’) in the world with what seem to be greatly different features, e.g. skin ‘colour’ and eye shape. How could we all have descended from one man and one woman? This is a stumbling block to some people believing the Biblical account. Sadly, as a result of evolutionary indoctrination, some people have racist thinking that people of a different ‘colour’ are inferior because they are supposedly closer to animals. Such attitudes are completely unscriptural (Acts 17v26; Colossians 3v11). We all have the same dark brownish pigment in our skin called melanin. (Albino people have none because they suffer from a mutation-caused defect, so that they lack the ability to produce melanin). People who produce lots of melanin have dark brown skin. People who produce a little melanin have pale skin. And in between are all the shades of brown. When God confused the language at Babel, it caused a breakup of the population into smaller groups, which scattered over the earth (Genesis 11v8-9). Modern genetics shows how that following such a break up of a population, variations in skin colour, for example, can develop in only a few generations. Melanin protects the skin against damage by ultraviolet light from the sun. So, people with little melanin in their skin would be more easily sunburnt and at greater risk of skin cancer in very hot climates. But people with lots of melanin in their skin need more sunshine for the production of vitamin D, so in climates with little sunshine they may be more likely to suffer vitamin D deficiency, resulting in a bone disease known as rickets. These factors may have contributed to where particular people groups survived in the world. The Asian eye gets its appearance largely by having an extra amount of fat than the Caucasian eye. It does not mean the eyeball is a different shape! Just because some else has a different skin colour or eye shape from us, it does not mean that we are not related. The genes for all these physical features were present in Noah’s family but the emergence of visible differences between various groups is only a side effect of the scattering from Babel. Moses married a Cushite or Ethiopian woman (Numbers 12v2). The Cushites were descendants of Ham (Genesis 10v6). God smote Miriam with leprosy for speaking against Moses. Salmon must have married Rahab after her deliverance from Jericho (Matthew 1v5 cp Joshua 6v25). Rahab was a Canaanite and they were descendants of Ham (Genesis 9v18; 10v6) but she is noted in the genealogy of Christ (Matthew 1) and listed for her faith (Hebrews 11v31). Ruth a Moabitess is also mentioned in the genealogy of Christ (Matthew 1v5) but she chose the true God as her God before her marriage to Boaz (Ruth 1v16). God does not forbid us to marry someone from a different people group but He is displeased with marriages between Christians and non-Christians (2 Corinthians 6v14). Cavemen supposedly lived thousands of years before modern man came on the scene. But God tells us the true history of these people in His Word. When God confused the languages at Babel and the various groups split up, people took with them their individual knowledge of technology. Some knew more about farming, some (such as those working on the Tower of Babel) knew more about building, and some knew how to use metal to make tools. Those groups who did not know how to do any of these things would be forced to ‘begin again’ – learning these skills on their own. Those who did have these skills were able to use them once they found a suitable place to settle. Many families who were not expert builders would have found caves a good place to quickly make their homes. However, there was nothing ‘primitive’ about them. They used musical instruments, drew fascinating pictures on cave walls, knew how to make stone tools, could make their own clothes and hunted their food with great skill. When their bones are found, they are similar to our bones, showing that they really were people like us! Evolutionists believe that the evidence they find of those who lived in caves points to us having less-than-human ancestors. However, seeing things from a Biblical perspective helps us to rightly understand that these people were descendants of Noah and were our relatives! The Neanderthals of Europe were once classified as ‘ape-men’ but are now recognised as having been fully human. They are now extinct but they showed evidence of vitamin D deficiency in their bones. This accounts for their stooped appearance. Could they have been a dark-skinned people group who were unfit for the environment into which they had moved because of their skin colour genes? Nimrod was the great grandson of Noah who became “a mighty one in the earth.” He obviously was a powerful leader in his day. Genesis 10v9 tells us twice that Nimrod was “a mighty hunter before the LORD.” God is emphasising something to us here in this verse. God wants us to understand that Nimrod was not merely good at hunting animals. Nimrod was a mighty hunter against the LORD – he was a mighty hunter of souls who led the people in rebellion against the LORD. Notice Genesis 10v10 tells us “the beginning of his kingdom was Babel (Babylon), and Erech, and Accad, and Calneh, in the land of Shinar.” These cities were built in the land of Shinar (in Babylonia) under the direction of Nimrod. Remember Shinar is where the people settled lest they should be scattered (Genesis11v1). Hence, one of his activities was the building of Babel. The name ‘Babel’ is derived from the Hebrew verb ‘babal’ meaning ‘to confuse’ but the ancient Babylonians called the city ‘Babilu’, meaning ‘gate of god.’ The temple tower in Babel was certainly a gateway to false worship. Then, God confused the language and the people had to scatter. Our English word ‘babble’ is derived from this story. After the dispersion from Babel, Nimrod went to Asshur (Assyria), and built Nineveh, Rehoboth, Calah, and Resen (Genesis 10v11). No wonder “the land of Nimrod” is mentioned in connection with Assyria in Micah 5v6. Nimrod led a well-organised rebellion against God’s noble purposes for mankind. The tower became a temple and observatory for studying the heavens. Rather than follow God, people foolishly began to follow astrological charts based on the zodiac. The forms of false worship found in the world today began at ancient Babel. The kingdom of Babylon had its roots in Babel and the rebellion led by Nimrod against the only true and living God. As you read through Daniel chapters 1-5 you will see that idolatry, astrology, soothsaying, and magic are all evil practices associated with Babylon. Isaiah 47v8-13; Jeremiah 50v2; 51v17, 44, 52-53 also describe the false worship, superstitions and sinful practices of Babylon. The people of Judah were carried captive into the land of Babylon (2 Chronicles 36; Jeremiah 52). Revelation chapter 18 describes the final judgement of Babylon for all her sins, despite her greatness, wealth, trade, power, and pride. Man’s disobedience is rebellion against the Thrice-Holy God. God must punish sin. There is only one human race (Acts 17v26), so we are all related irrespective of culture, physical appearance, nationality or language. All the tribes and nations of the world are descendants of Noah’s family. The most impoverished tribal people, living in remote parts of the earth, with all their animistic superstitions and fear of evil spirits, are part of Adam’s fallen race and their ancestors were scattered from Babel too! Education and technology are not enough to change these people but we are not to treat them as inferior. Remember, God loves them and sent His Son to die for them. They need God’s saving grace too! That is why Christ gave the command to go into all the world and preach the gospel to every creature (Mark 16v15). What a day it will be when those from every nation, tribe and tongue are gathered around the throne of God in heaven, redeemed by the precious blood of Christ! (Revelation 7v9-17) There will be some from the remotest primitive tribes in that countless number. Will you be there?